Supreme Court Declines To Take Up Pennsylvania Redistricting, A Blow To GOP The court decided Monday not to take up a GOP challenge to a Pennsylvania state court decision that could result in Democrats picking up a handful of House seats. Former California Gov. 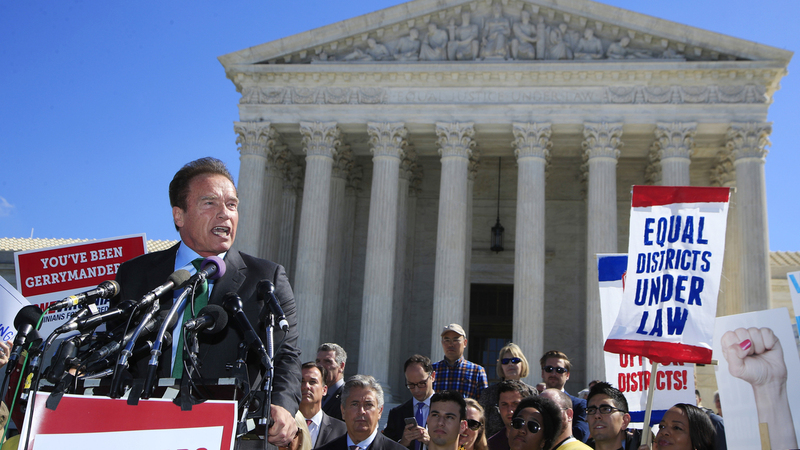 Arnold Schwarzenegger speaks at a rally outside the U.S. Supreme Court in October on the day arguments took place in a case about political maps in Wisconsin. Last month, the Supreme Court also declined to block the state court decision that said the old GOP-drawn map violated the Pennsylvania Constitution. Republicans drew a gerrymandered map in 2011 that resulted in a 13-5 congressional district advantage. That was despite Democrats having won the state in five straight presidential elections at the time. Democrats need to win a net of 24 seats to win a majority in the U.S. House. The decision comes on the same day a federal court dismissed a lawsuit filed by Republican congressmen challenging the new map. It's a double gut punch to the GOP and all but guarantees that Democrats pick up a few seats, and in an election with control of Congress at stake, every seat counts. Legally, the challenge could also open the path to a slew of state court challenges. Challengers to the 2011 GOP-drawn map called into question its legality based on the state constitution, a rarity that could provide a road map for challengers in other states. The Supreme Court's decision Monday also shows a possible reluctance to weigh in on state law when it comes to redistricting. This is not the last say the Supreme Court will have, however, on redistricting. It is hearing arguments March 28 on a Republican challenge to Maryland's Democratic-drawn congressional map, and the court has a decision pending on a Democratic challenge to GOP-drawn state legislative districts in Wisconsin. Both cases deal with political rather than racial gerrymandering. While the court has ruled previously on racial gerrymandering, it has never ruled on political gerrymandering. The Supreme Court will hear arguments April 24 on racial gerrymandering in Texas as well. And the court also temporarily blocked a lower court's decision in a racial gerrymandering case in North Carolina ordering the state to redraw a map that was favorable to Republicans. A previous version of this story gave the wrong date for the 2018 Pennsylvania primaries. They will be held on May 15.